Have you ever thought about that before…I mean REALLY thought about it? Weight loss (i.e. 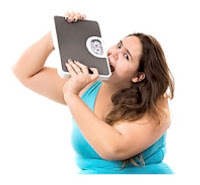 fat loss) only occurs when we “EAT UP” more of our own “internal” stores of energy (i.e. stored body fat) than we do “external” sources of calories (i.e. the food we put into our mouth). Conversely, if you eat more “external” food than “internal” food, you get fat!! When it comes to the optimal diet and exercise prescription for fat loss, people are obviously still confused. For example, I’ve talked with hundreds of people over the years about their diet and lifestyle, and I can’t tell you how many people have told me that they skip meals on a regular basis. My reply almost always shocks them. The day you “skip a meal” is the day you die! You see, your body, just like an automobile, only runs (stays alive) as long as there is always a steady stream of fuel available. We all know what happens when our car runs out of gas? That’s right—it dies!! The same thing would happen to us if our body ever ran out of fuel. But the human body does not function the same way an automobile does (thank God). It is designed to make “meals” of itself whenever “external” sources of fuel (food) is not available (such as during a fast). The primary fuel the body uses when “external” sources of food are not available is FAT!! Being able to eat anytime we want and snack between meals are relatively “recent” Tupperware.Our grandparents and great-grandparents simply did not have the ability to purchase, process, and store food in their homes to the degree we do today. Therefore, they could not just eat anything they wanted, any time they wanted. They had to go without from time-to-time. Eating only 3 square meals a day was common for them. It was the space between each meal (the post prandial “space”) where a large amount of their stored fat was burned—especially when they were physically active during this time! Giving your body a break from food for 3-4 hours AT LEAST between meals is very important to help reduce sugar levels and burn more fat. While it’s a subject I’ll write more in depth about another time, let me just say that I honestly believe that the whole “eat many small meals throughout the day”philosophy has done more to make us overweight than just sticking with the same 3 square meals a day that our ancestors consumed. Eating incessantly all day long (i.e. SNACKING) is the worst thing you can do if you want to burn lots of body fat! You are burning off almost exclusively the food you eat rather than the food you wear!!! This is either a result of too much eating, or too little exercise, or BOTH!! A good example of someone potentially sabotaging their fat loss efforts is when someone is consuming sugary drinks before, during, or immediately after exercise. By doing so, the body will simply burn off the carbs rather than burning stored fat!! Unbeknownst to many, the body has the ability to alter what fuel it runs on largely based upon the kind of food we eat, in relationship to its proximity to exercise, and based upon the type and length of physical activity we engage in. By consuming carbs before a workout, for example, we shift oxidation rates (calorie burning) toward the burning of carbohydrates and away from body fat! Did not fuel-up properly before 1-3 hours before exercising. Are doing especially lengthy exercise lasting 2 hours or more. Have a medical condition (like hypoglycemia or diabetes). Do not want to lose weight. Over-exerted themselves to the point that blood sugar levels are dangerously low (hypoglycemia). Have you ever seen someone who is no more than five minutes into their workout and they are already chugging down a sugary drink like Gatorade or a Red Bull? What about the person who gets up in the morning and is eating before or during their morning cardio? These individuals may not realize that instead of burning body fat, their use of dietary carbs during exercise (or just prior to) is shifting their body out of “fat-burning mode” and into “sugar-burning mode.” The carbs may help them get through their workout and even increase their performance, but as a result, they hardly burned any body fat at all!! The same thing can happen when someone eats a whole bunch of carbs right after their workout. Their body had just got into “prime” fat burning mode and they unknowingly shut it right off by ingesting a whole bunch of carbs post-workout! While it’s certainly important to get some healthy carbs at some point post-workout, and they can certainly speed recovery and promote anabolism, consuming them IMMEDIATELY upon ceasing exercise or DURING exercise may not always be your best strategy… at least not if maximum fat-burning is your primary goal! Athletes and those who are already lean may have good reasons to consume carbs immediately before, during, or after exercise such as for “maximizing their performance,” “enhancing recovery,” and “building muscle,” but these things are not necessarily synonymous or necessary for those seeking to maximize “fat loss.” A far-more effective strategy to maximize fat loss would be to consume a meal rich in complex carbohydrates an hour or two before the workout and only drink water during the exercise session. After the workout, rather than ingesting carbs right away, they could take some BCAA’s (Branched Chain Amino Acids) or HMB and then go for a walk or easy jog (a “workout after the workout”) to increase the oxidation of fat in their blood. After your walk, you could then have a healthy meal that contains some protein, veggies, and some starchy carbs (if you like). For example, this could be a meal of baked fish, a sweet potato, and a side of steamed broccoli. If you can’t go for a walk after your workout, even just giving yourself an hour or two to relax with no food can be helpful at increasing the amount of fat burned. For those of you who dispute carbs interfering with fat burning, I’d encourage you to do some research. Now don’t get me wrong: I AM NOT saying that you should avoid carbs or eat a low-carb diet—NOT AT ALL. In fact, I think a rather high-to-moderate carb diet is ideal. I am specifically referring to meal timing and frequency. Because our body finds carbs to be much easier to burn than fat, whenever carbs are present, the body will burn almost always exclusively burn carbohydrates and simultaneously reduce its oxidation (burning) of stored body fat. In fact, some pretty fascinating experiments (such as this one here) have demonstrated that when carb intake goes up, carb burning (oxidation) goes up as well. In fact, fat oxidation rates are suppressed in almost direct proportion to the number of carb calories consumed. In other words, the more carbs you eat, the more carbs you burn and subsequently less fat. Knowing this has led many people to mistakenly assume that the only way to maximize fat loss is to therefore adopt a low-carb diet. But the truth is that you can still burn a ton of fat on a high-carb diet, especially when your dietary fat intake is low and you use proper timing of carb intake! But our ancestors not only ate less often, they also exercised FAR MORE than we do today! The problem for most of trying to lose weight today is that it is not as simple as just eating less, but that we get no-where near the physical activity we need to lose weight! We mistakenly assume that if we exercise 1-3 times per week that we should expect to see amazing results.But this low level of physical activity is a mere pittance compared to that of our ancestors—and they were eating far less food than we are!! Data released from a 2,000 USDA report revealed that the average American is now consuming almost 800 calories per day than the average American living in 1950. That’s pretty amazing when you consider that obesity rates in 1950 were only around 9%; today, they are 35%! Research from other studies and health organization have demonstrated that high physical activity levels can help with maintenance of weight loss. In one study, subjects who exercised enough to expend 1000 calories per week (about 2 hours per week) regained most of their weight, but subjects who expended 2500 calories per week (about 4.5 hours a week) maintained most of their weight loss. Similar results have been observed in other studies. 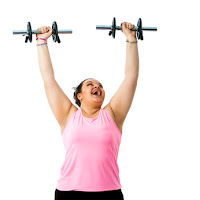 Subjects in the National Weight Control Registry (NWCR), a database of individuals who have maintained at least a 30 pound weight loss for over a year, expend an average of 2,620 calories per week in physical activity. Great question! I’m glad you understand how important it is to get sufficient exercise. 12 McDonald’s cheeseburgers worth of energy! Incidentally, that means that someone who wants to lose 40 pounds of fat would eventually need to burn off approximately480 cheeseburgersworth of stored calories!!! If weight loss worked like basic mathematics, and we wanted to lose 1-pound of fat over the course of seven days, then this would mean that we simply need to “burn off” 3,500 calories above our current caloric needs. If the average calorie burn for a 1-hour, high-intensity workout was 500 calories, then seven of these workouts (7 X 500 = 3,500) should burn off 3,500 calories and—BOOM!—one pound of fat is gone in a flash!! While this way of thinking certainly makes sense from a mathematical perspective (and is still being taught by many health and fitness professionals, today) unfortunately IT’S COMPLETELY WRONG and does not accurately portray all the facts!!! 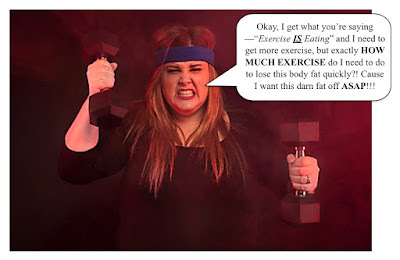 WE DO NOT BURN EXCLUSIVELY FATDURING EXERCISE. In most cases, it is relatively safe to assume that close to ½ of the calories you burned during an hour of exercise may have come from stored fat; whereas the other ½ came from stored carbohydrate. So let’s say that you do a 1-hour workout and burn a total of 500 calories, you’d be pretty safe to assume that you only burnt around 250 calories from stored fat. Waking up at 4 am to do 90 minutes of vigorous weight training and calisthenics. He followed that with a jog or swim for 30 minutes. Afterwards, he’d eat a late breakfast made up of mostly raw vegetables (often in fresh juice form) sometimes along with some egg whites. And Jack made it a point to only eat 2-3 times a day (NO MORE). HMMMMM…. 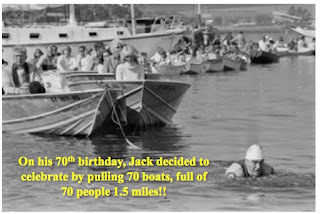 Jack was still doing this same routine DAILY up until he passed away in his late nineties. And while fourteen hours of exercise a week may certainly sound extreme to those of you who only work Loser show (and these were not athletes, but out-of-shape, obese, and even diabetic individuals) were utilizing. 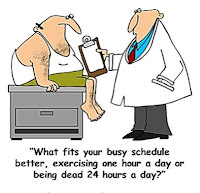 They were doing the equivalent of 24-28 hours of exercise a week!!! Legendary singer song-writer, Tim McGraw, apparently decided that the key to ripped six-pack abs was not only a big change his diet (he dramatically reduced his sugar and alcohol intake as well as “beefed-up” his protein intake), but to get his physical activity level MUCH higher than it had been before. He began working out over 4 hours a day to get his dramatic results!!! That’s about the same number of hours each day that the Biggest Loser contestants were exercising! Check out Tim’s transformation and exercise here. I can personally attest to this strategy for maintaining weight loss because I too exercise approximately 14 hours (give or take) a week to maintain my weight loss. I usually do seven weight training sessions a week along with seven or more cardio sessions a week (some high intensity and others low intensity). Part of the reason I like to work out more often is because I can also eat more while staying lean. If I exercised less, I’d have to eat far less. Allowing some space between meals may help us lose more body fat than eating round the clock. 3 square meals a day is how our ancestors ate and obesity levels were only 9% in 1950; today they are at 35%. Not all calories burned during exercise come exclusively from fat. Getting a high level of physical activity is super important for the overweight to reduce risk of disease and to elicit rapid fat loss. 1-2 hours per day of physical activity is necessary to lose weight for those who want to be able to eat a fair amount of calories and still lose weight. Finally, if “Exercise IS Eating,” are YOU eating enough? !